Like many anglers, my piscatorial childhood was shaped and influenced by unwanted fishing tackle; hand-me-downs, battle-worn Mitchell reels, threadbare cane fly rods, gritty wooden centre pin reels and fibreglass rods capable of game fishing in the Atlantic. Unwanted by their previous owners yes, but dearly cherished by me and were now members of a newly found movement. These adventures were influenced by a third edition copy of 'Mr Crabtree Goes Fishing' bought for the princely sum of 5p from the local Church Summer Fete. The yellowed pages suggested this must-have guide book had brought about many an adventure for its previous owners, and now it was ready to start all over again. This, I am sure, is typical of childhood for many an angler; all sharing that dream of secluded, reed-lined, lily-choked ponds. But for me, I was lucky; I had just that little bit more – my own pond, not two minutes from my bedroom door. In the early 1980's my father undertook a renovation project on a local farm dwelling that had been neglected since the end of the Second World War. In time this lovely rural cottage progressed to a self-contained smallholding with friends’ livestock grazing on the surrounding land. Of course such a setting wasn’t complete without a farm pond, and before long such a feature was dug complete with island and populated by half a dozen Khaki Campbell ducks (much to the delight of the local fox I might add). The deep clay-coloured water was soon home to two milk churns full of golden rudd between 4” and 6” in length. At the time the rudd was a fish I’d not heard of, but soon marvelled at their golden flanks, sparkling eyes and bright red fins. For good measure they were joined by four goldfish. For any angler, let alone an 8-year old boy, this was a dream come true; a farm pond filled with stunning fish right on the doorstep. This was left to settle and mature through the Autumn, Winter and Spring of 1989. Respectful of the closed season that was so strictly adhered to back then, June 16th arrived like a second Christmas in six months. I made my way down to the pond with my over-zealous 12ft fibreglass match rod. The rod was tackled up with a paint chipped Mitchell reel (masking tape applied by my dad ensured that it didn’t move at all, potentially leading to a tangled inconvenience), a length of kinked nylon capable of hauling the heaviest of sharks, a float better suited to the Atlantic and an oversized hook. I can still remember the sweet smell of the early summer air as I made my way down the steep banks. The layout of the pond had a perfect, yet unintentional, flat area which became the best spot for both comfort and fish location. Bait, a wriggly worm, was extracted from beneath one of the garden gnomes sitting beside the pond. The giant float made its presence known as it crashed into the water but rather than ruin the swim it seemed to have the opposite effect, with a bite arriving almost instantaneously! The fish was quickly brought ashore – of course it was a small rudd of around 4” in length; unremarkable to many maybe, but it was mine, my first fish from my own pond! The lively silver-gold character was carefully returned and I searched under the gnomes for more bait. Again an instant response was met as the worm settled in the water, a slightly larger fish this time – and for an 8-year old boy, the catch of a lifetime! 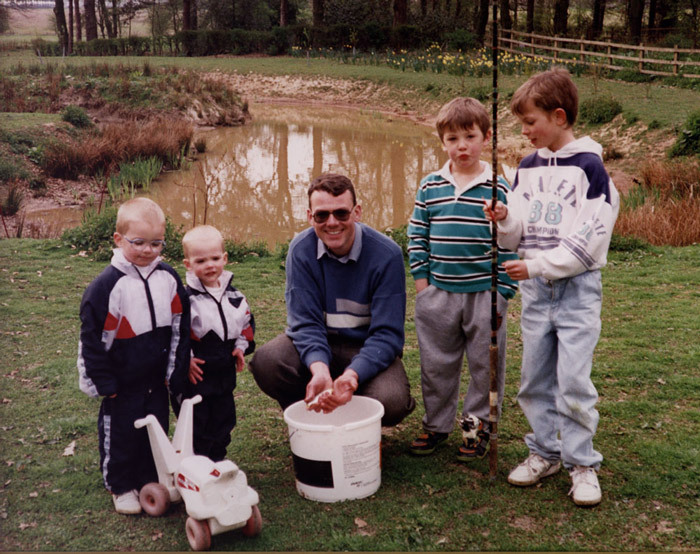 My own little fishing paradise at such a young age – it couldn’t get any better. Sadly, the gnomes chose to provide no more bait on that occasion and that first visit to my very own slice of heaven came to an end. I joyfully skipped along the path back to the kitchen door elated at the morning's happenings. Not particularly exciting for the average angler but it lit a fire within me and this continues to burn nearly 30 years later. At that stage of my life, visits to see my father were, at best, limited to fortnightly weekend trips – not as often as I’d have liked but my absence from the pond ensured that the anticipation of the next visit began to grow the moment I left. Anglers today will know that feeling; the night before a long-planned trip – a sense of excitement and anticipation. For me, I had this same feeling continually for two weeks at a time, with the only relief being the two days I was beside the pond. The pond became a popular destination for friends too. Sunday afternoons with my father were often shared with a friend from school. On reflection, it was a nigh on perfect tool to introduce youngsters to the joys of angling. A fish almost every cast, an un-pressured and peaceful environment, supported in the knowledge that the warm and dry house lay just yards away should an escape be necessary. Perhaps surprising to many, the joy of catching one small rudd after another failed to waiver. But naturally as one learns more about the water they are beside, a fascination with the other inhabitants becomes to simmer – in this instance, thoughts of the handful of goldfish that resided within the pond began to develop. Occasional glimpses of bright orange amongst the reeds confirmed their presence but never did they show an interest in the gnome’s worms or bread from the kitchen cupboard. To a young boy they seemed uncatchable. On one particularly damp Sunday afternoon in August I had an overwhelming urge that the opportunity to realise my goldfish ambition was now upon me. Using a small pinch of ‘Mighty White’ (remember that?!) beneath my now more realistically sized waggler, I perched on my folding wooden stool beneath a small umbrella borrowed from the cottage. After a rare period of inactivity, the float bobbed tentatively and a gentle strike revealed a brief flash of orange. My heart skipped a beat. The fish came in with relative ease and was of impressive proportions - a good 2lb or so. Already running late for Sunday Lunch, in my naivety I elected to leave the fish on the end of my line so as to savour his beauty more closely later in the afternoon. Lunch was of course devoured with haste and I returned to my rod in anticipation of seeing my dreams come true. Of course, I was met with a bare hook and a lesson was quickly learned. Unknowingly at the time, the old rudd pond played a key influence in developing the watercraft that I possess today. It is something that cannot be taught, but by being in the right location and being encapsulated by the environment, you subconsciously take it all in. With the escaped goldfish I was taught the importance of appreciating the moment there and then, take it in and absorb it. Don’t ever think that you can make a great moment even better – be grateful for that opportunity when it arises. It may never happen again. As time passed, nature made its mark and continued to reclaim the pond, reed by reed, each year. Rather than feel intimidated by nature’s intentions, a new opportunity was embraced. The old rudd pond indirectly taught me new skills and the importance of adaptation. In this instance freelining and stalking; a method that actually produced a rudd of over 2lb on one occasion! This is one of the truly memorable angling occasions of my childhood, a defining moment to the extent that it remains my preferred approach to this day. Nature finally took full control of the pond as I approached my 18th birthday. Ironically as I moved away to commence my University studies, my former preferred method of piscatorial education ceased to be. I firmly believe that this was nature’s intention; she taught me valuable lessons during the decade we spent together beside the old rudd pond and, as I demonstrated my knowledge she displayed her acceptance in allowing me to move on. Sadly, the pond has ceased to exist physically but will forever remain within my mind; indeed those memories and lessons learnt are present every time I am bank-side.